I sure do love playing pre-release versions of my favourite games. Many of them act as windows into the development studio and allow you to see what content was added, and in some cases removed, prior to launch. If you too share my passion then you’ll definitely get excited for a series of pre-release Dreamcast games that have been appeared for auction on the UK version of eBay. 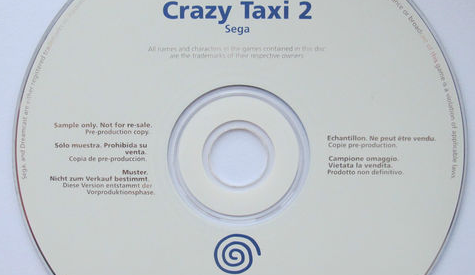 Some of the titles come on Sega’s ‘confidential’ GD-ROMS, while others have their own unique disc labels, complete with that classic blue Dreamcast swirl. With games such as Crazy Taxi 2, Shenmue, Ecco the Dolphin and many more being bid on as we peak, I suggest you click the source list and a grab a deal while you can! Wow, these haven’t been getting many bids! You going to bid on one Michael? Actually I would love to, but right now I don’t have the money, even if they are cheap as chips.